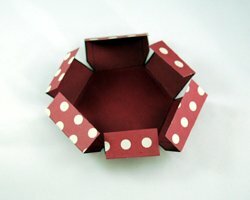 This hexagon explosion box would make a creative and unique gift for your loved one. 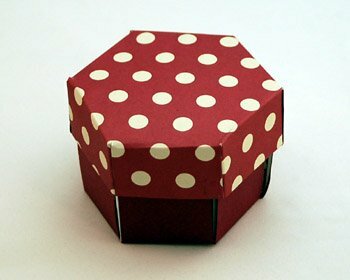 Explosion boxes look like a little gift, but when the lid is removed the sides fall down to reveal multiple tags where you can put photos, sayings, and other embellishments. I've always been a fan of the square explosion boxes, but I wanted to try to make a hexagon version so I could have more tags for photos. 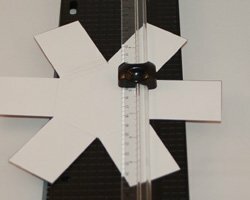 I designed the patterns, and included them for easy printing. The best thing about this project is that it is quick and easy to put together. The patterns fit a standard 8.5x11 inch sheet of paper that will fit into a standard printer. In this way, you can print right on to your patterned paper or cardstock you are using, and just cut and fold on the lines. If you would like to make the pattern bigger (for 12x12 paper for instance), simply print out the patterns and enlarge them to any size you choose with a photocopier. Making the actual box is easy. 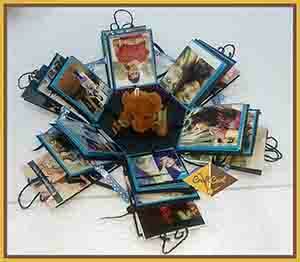 Most of your time for this project will be spent adding photos and decorating it. Your sweetheart is going to just love this thoughtful and personalized gift, that you made yourself! 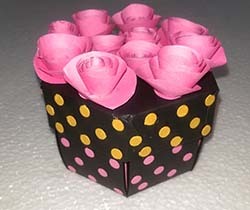 Four sheets of 8.5x11" cardstock or patterned paper (in coordinating colors). 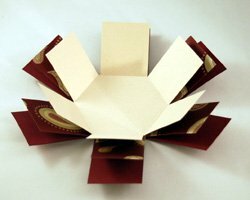 Tip: The box will be more sturdy if two of the sheets (the bottom layer and the lid for the box) are made of a heavier type card stock. 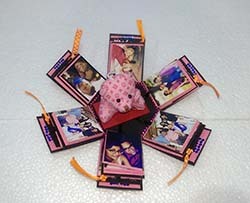 Photos, die-cuts, stickers, embellishments, etc! Check out the scrapbooking aisle in your local craft store for tons of options! 1. Begin the hexagon explosion box by clicking on each of the patterns below. A PDF file will open (Adobe Reader is required) for easy printing. Put the card stock or patterned paper you are using directly in the printer to print right on to it. It works best if you use a heavy card stock for the bottom layer and for the lid. Once you print them, cut out the patterns. For the lid pattern, only cut on the bold lines. The other lines are the folding lines. 2. The next step is to fold each tab on the star-like patterns you printed. It works best if you have a scoring tool and bone folder, like the attachment I have here on my paper cutter. This will ensure a nice straight fold. Once you have made a fold, fold it back and forth several times to "wear in" the fold. This is because you want the tabs to fall back easily when the lid is removed. 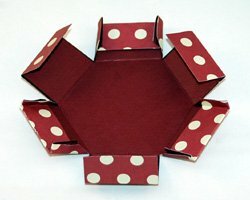 Once you have made all the folds, you can begin to assemble the hexagon explosion box. Layer and glue the three stars on top of one another. Begin with the largest on the bottom, then the middle size, and then the smallest star on top. Only add glue to the center hexagon, allowing the tabs to move freely. This forms the bottom of the box, and it is complete except for all the decorating. 3. The next step is to prepare the lid. A heavy card stock works well, but as you can see I chose to use a patterned paper for the lid. I printed the pattern on heavy card stock, but then glued a thin patterned paper to this card stock to make it more sturdy. 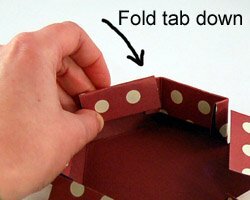 Make the first two folds on each tab first, as shown. 4. Next, fold the side "tabs" that are on every other side of the hexagon. 5. The side tabs will fit inside the fold of the side next to it. 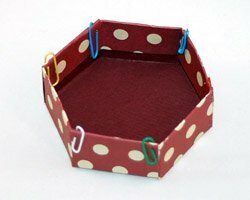 Apply glue to keep everything together, and then use paper clips to secure this while you allow it to dry. 7. The majority of this hexagon explosion box project will be all the decorating, and there are so many options here. I gave this explosion box to my husband. The top layer is all about our wedding. A few tabs had photos, one tab had our vows printed on it, and on one tab I glued two small wedding rings with our wedding date. The middle layer included photos from various vacations we have taken, and the bottom layer included photos of our family and children. Each layer moved chronically through our relationship, beginning wtih our wedding as the top layer and finally to the bottom layer which highlights our children. Be creative. You are only limited by your imagination. I can think of a lot of possibilities, as I'm sure you can too! Make each tab have a question about the two of you, with the answer on the tab behind. For example "My favorite thing about you is...", answer "the way your smile can make my day". 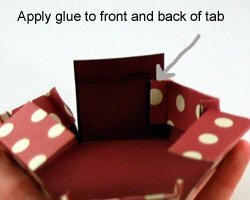 Glue a small candy to each tab. 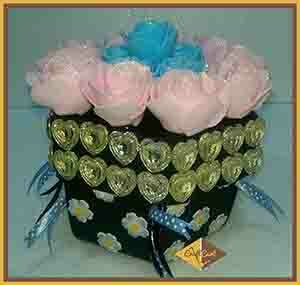 Attach ticket stubs, pressed flowers, or other special symbols of your life together. "I loved this project, really a good idea! Here's a photo of one I made." 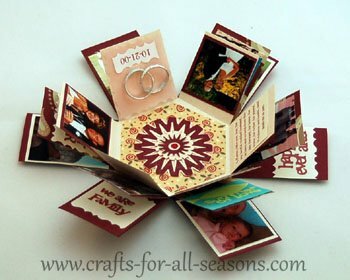 Response from Crafts For All Seasons: How beautiful!! 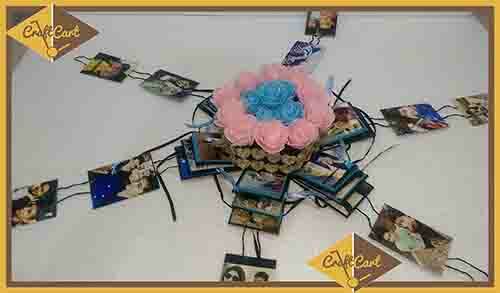 Thank you for sharing a photo of your wedding card box - you did a great job! 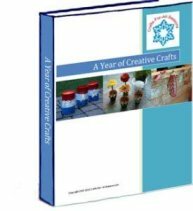 Response from Crafts For All Seasons: I love it when I post a simple example, and then I see the amazing works of art that my visitors make! Both of these explosion boxes are absolutely beautiful and so creative!! 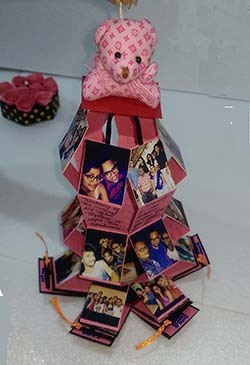 I love how Divya made this several layers tall by creating folded accordion tabs. When she pulls up on the stuffed bear, the entire project opens up and all the pictures are revealed. 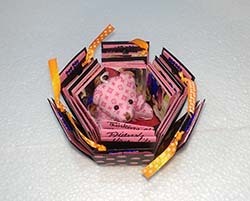 There are also creative touches, like the little cards that pull out of pocket folders using the ribbon tabs. 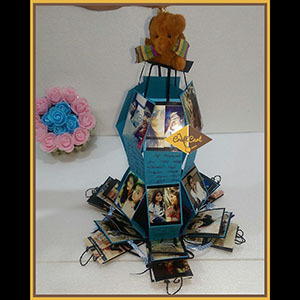 This is truly a work of art, thank you Divya for sharing this project!"